Due to remodeling at the Monroe Arts Center this event will be rescheduled. As soon as a date has been established it will be published. Please keep checking back. We are pleased to announce an open call for artwork for our sixth annual juried art and science exhibition, fundraiser and membership event entitled: Seasons of the Sugar River — familial vistas beyond the fencepost. 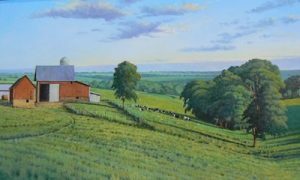 This exhibition seeks to showcase the scenic landscapes of the Sugar River Watershed from the headwaters region in western Dane County to the lower basin where the river converges with the Pecatonica River in Northern Illinois. A popular feature of the exhibition is the array of science exhibits geared for children and adults that explore and illustrate the geography of our watershed and the role of our natural and cultural landscapes in influencing water quality. Through the artistic expression of local and regional artists, we hope to share more broadly the mission of our organization to foster awareness, sense of place, and stewardship of the natural assets of our watershed community. With the support and participation of the Monroe Art Center and our artists, the work of LSRWA will continue to bring people together who love the Sugar River Valley and the rich, productive landscapes of Southern Wisconsin and Northern Illinois that surround the river and its tributary streams, all of which form our watershed and connect us to each other and to the land. We believe the health and abundance of natural assets of our watershed—the deep agricultural soils, the forest, prairie, wetland, and aquatic habitats that support an abundance and diversity of wildlife, and our surface and groundwater resources—are integral to a robust regional economy and culture, and are necessary to sustain our lives. We believe that these assets will benefit from our collective stewardship, now and into the future. The Lower Sugar River Watershed Association (LSRWA) is a not-for-profit conservation organization based in Brodhead WI, dedicated to empowering citizens with experience and knowledge to steward land and water resources in the Lower Sugar River Watershed. The Seasons of the Sugar River Exhibition is sponsored through a partnership between LSRWA, the Monroe Art Center, and supported by contributions from local food purveyors and merchants. For Call for Art details click here. For application in PDF and Word format respectively click here and here.